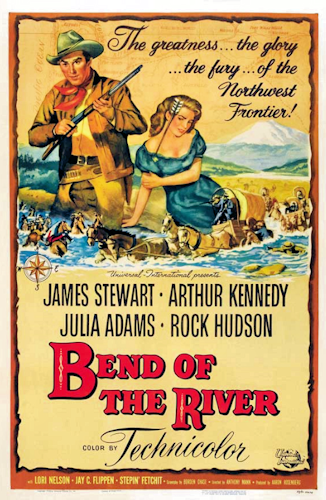 Jimmy Stewart: Bend of the River (1952) – Did You See That One? 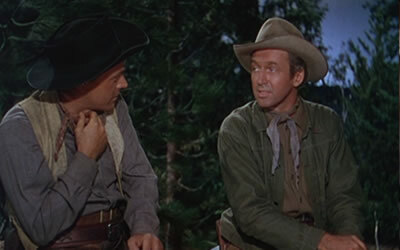 Jimmy Stewart and Anthony Mann combined on eight films in a little over six years. The majority of their success came from the work they did with Westerns. This was a sort of resurgence in Stewart’s career, as increased his popularity through performances that presented a more mature, complicated, and intense presence. This film was their second project together, following the success of Winchester ’73. This film reconnected Stewart with Rock Hudson (Giant), who had also been in Winchester ’73. A couple other Stewart collaborators are also featured, including Arthur Kennedy (The Man From Laramie) and Harry Morgan (Thunder Bay). Howard Petrie (Seven Brides for Seven Brothers) also has a nice role in this movie. Glyn McLyntock (Stewart) is trying to help bring a group of settlers into Oregon. Along with Emerson Cole (Kennedy), Glyn has been able to get safely to Portland. Once in town, the settlers make a deal with Tom Hendricks (Petrie) to have supplies sent to them before winter. When the supplies fail to arrive, McLyntock takes action against the increasingly powerful Hendricks. The followup to Winchester ’73 does an excellent job with the story. The film is based on the novel Bend of the Snake by William Gulick. Borden Chase (Red River) adapted the novel for this movie. The writing breaks up the action into a series of episodes that each serve a unique purpose in the bigger story arc. The character development is nicely done, allowing the bigger roles to remain somewhat mysterious. This mystery plays well with the more conflicted nature of the characters, and allows for some great payoffs late in the story. In many ways this movie seems to dig a little deeper than Winchester ’73 had when it comes to the gritty nature of the story. Jimmy Stewart does a great job leading the way in this film. Like his other roles in Mann’s films, he was asked to play a grittier and more intense role. He does a great job bringing out the internal struggles of his character, holding a lot of emotion just under the surface. He also handles the more overt expressions of emotion with great skill. The movie also benefits from good work by Rock Hudson and Arthur Kennedy. The two actors add some depth to the story with the unique characters they portray. Frequent Stewart collaborator Harry Morgan also does a great job with one of the smaller roles in the movie. The film also benefits from a really great villain. Like all of Mann’s Westerns, the film needed someone to bring the nasty side of a character out. This time it was Howard Petrie playing the part. 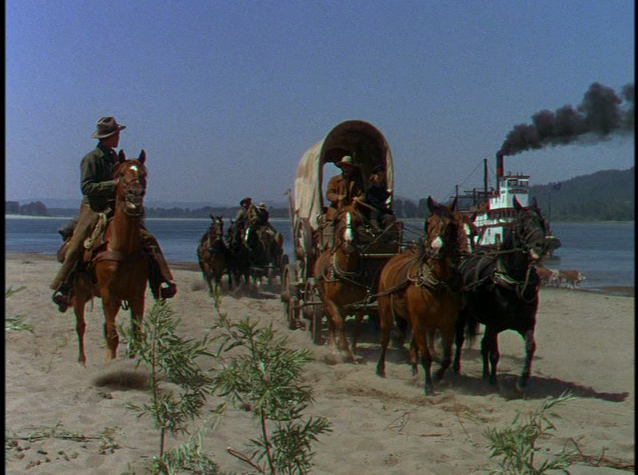 The use of Technicolor brought something special to the Westerns of the 1950s. This movie is no exception. 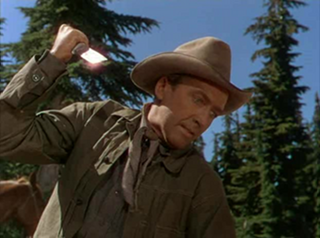 The movie was shot in locations like Mount Hood, Sandy River, and Timberline. Each shot seems to acknowledge the power of the natural surroundings, making nature another character in the film. The cinematography also seems to get in close at just the right moments, accentuating some of the more intense moments of the story. This film is one of a series of great choices made by Stewart in managing his career. His popularity would boom as he continued his partnership with Mann. This movie was followed up by Carbine Williams, another biographical film directed by Richard Thorpe. 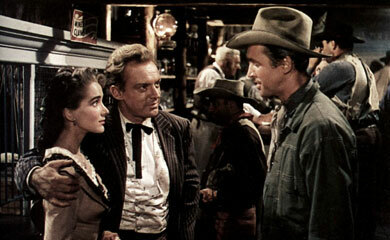 His next work with Mann came soon enough, with 1953’s The Naked Spur, which paired Stewart with Janet Leigh. Pingback: Jimmy Stewart: The Greatest Show on Earth (1952) | Did You See That One? Pingback: Jimmy Stewart: Carbine Williams | Did You See That One? Pingback: Jimmy Stewart: The Glenn Miller Story (1954) | Did You See That One? Pingback: Dr. Broadway | Did You See That One?